Making the transition from recognising individual letters and the sounds that they make to blending them to form the first words read can be a transition that some children find difficult. I know my daughter did. We used all sorts of fun activities and games to get her blending phonemes and digraphs together to form words she could read. Using the idea of sound buttons in words where each letter or digraph the child presses a “button” on the sound and says it blending it with the others sounds around it so we created our own Frog Hop Phonics Game to blend the words. We have included affiliate links to products and resources we recommend. If you make a purchase through the link we may earn a small commission. 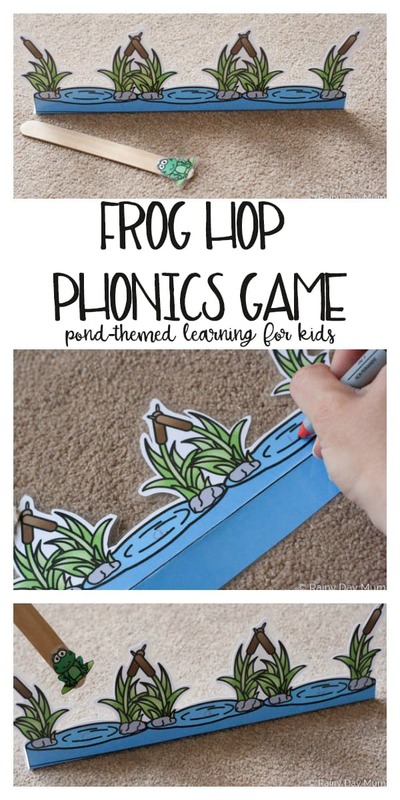 Frog Hop Phonics Printable which you can download for FREE when you join our Weekly Hands-on Activities Newsletter or purchased in our Store. 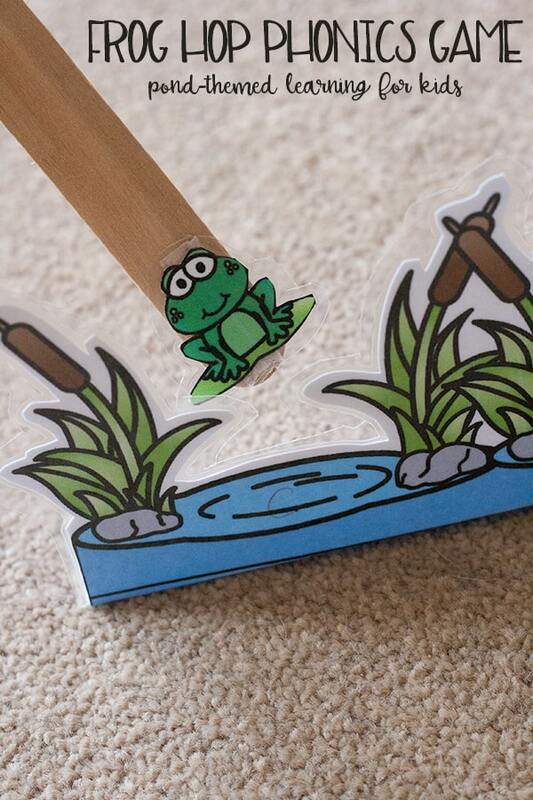 Join our Weekly Hands-on Activities for Learning Newsletter and get this Frog Hop Phonics Game for FREE! 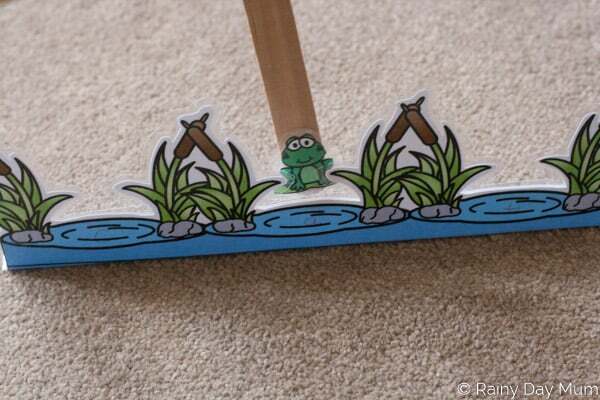 Laminate the ponds and the frog. 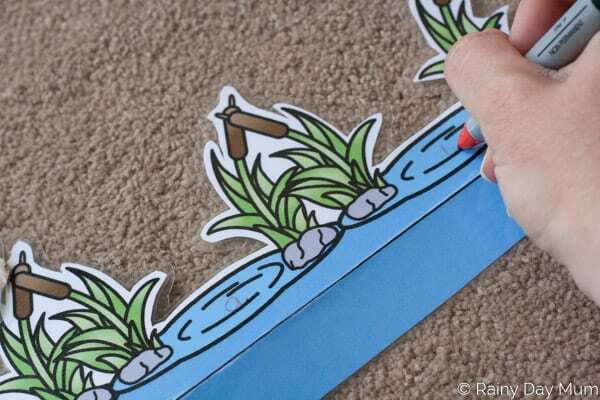 Fold along the line so your ponds will stay up. We have been using sounds and letters phases with my youngest – these introduce the different phonemes, digraphs, and trigraphs at different stages of the most common working through to the more complex as they go so using these we have worked through forming simple CVC words like S-A-T, C-A-T, P-I-T, S-I-T up to words using the igh trigraph like light and then words with different graphemes producing the same sound like the “ur” sounds in Burn and Bird and Worm. 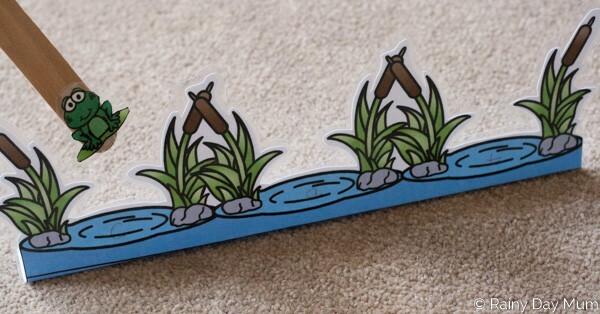 Work out what stage you are at with your child and then use the pond to write the word on the pond putting each phoneme on a separate pond. E.g. if the word was cat the “c” would be on the first pond “a” on the second and “t” on the last. Or burn b on the first ur on the second and n on the third. 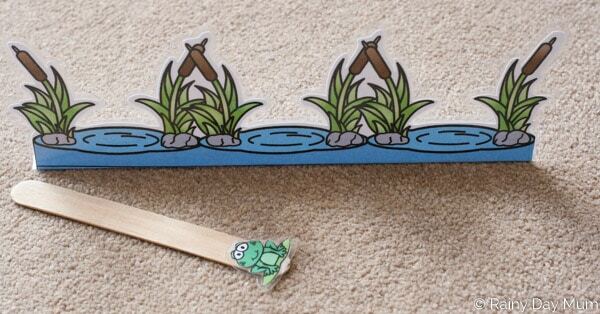 Now with the ponds facing your child get them to hop the frog behind the ponds saying each sound as they go. Start off slow and then speed up so that your child is blending the word together quicker and quicker until it is smooth. When they have that word wipe clean and use a different word. In the UK one of the tests that children do in year 1 of school is a phonics test where they have to read and blend real and nonsense words reading them accurately using their phonics knowledge. 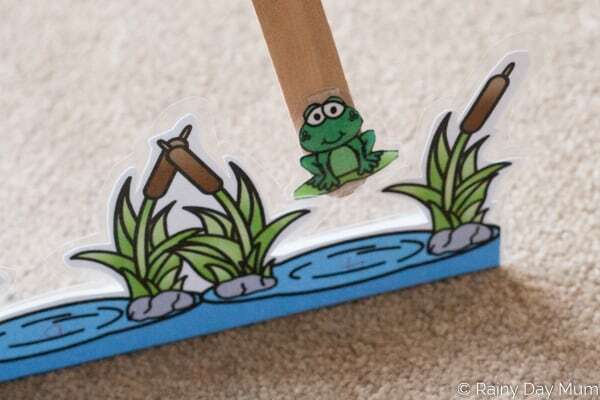 Using the Frog Hop Phonics you can use the same method to get your children to read a mix of real and nonsense words aloud in preparation for both that test and to check that they are getting to grips with the different sounds. This week’s feature book for Virtual Book Club for Kids is based on the Pond theme and is by the fantastic children’s author Denise Flemming. 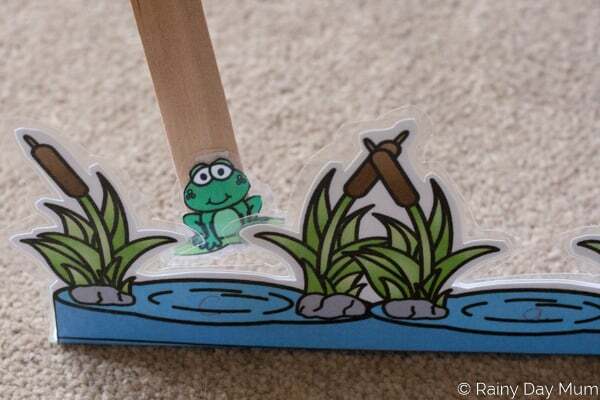 In the Small Pond is a great book for toddlers and preschoolers giving them a view of life in the pond through the seasons from the perspective of a Frog! 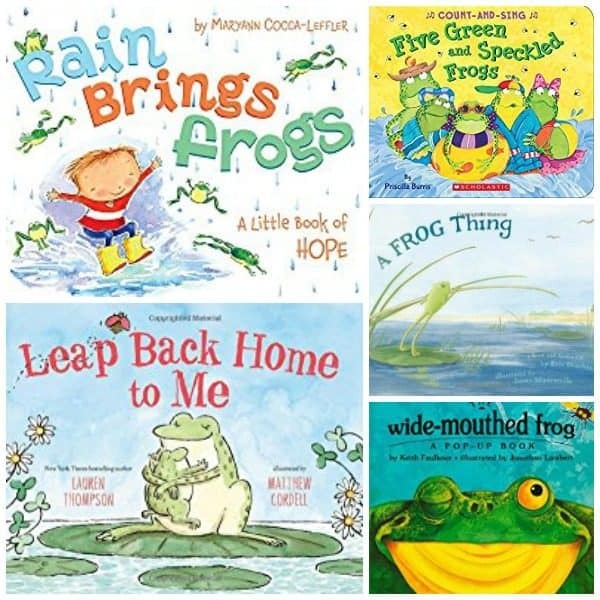 Don’t worry if you can’t find In a Small Pond by Denise Flemming as we are fans of the theme of ponds and in specific Frogs and we have a Frog Books List to choose from of fiction and non-fiction frog books for toddlers and preschoolers. As part of the Virtual Book Club for Kids we love to provide you with a selection of crafts and activities based on the popular theme by the co-hosts of the Virtual Book Club. 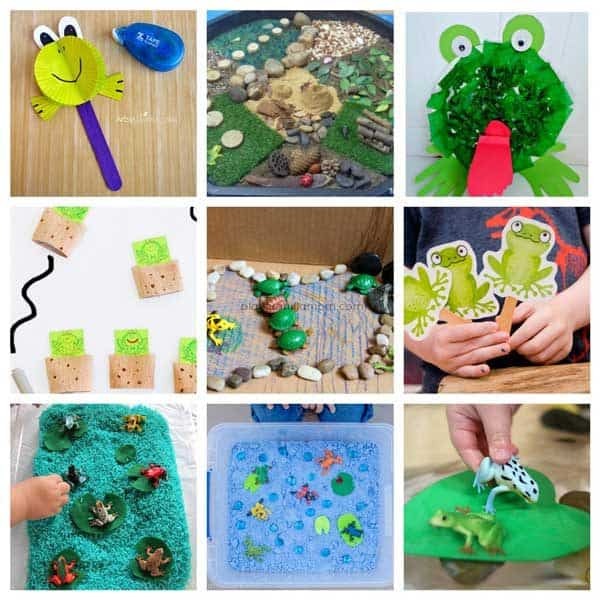 So do check out these other ideas for crafts, learning and play for toddlers and preschoolers on the pond theme. 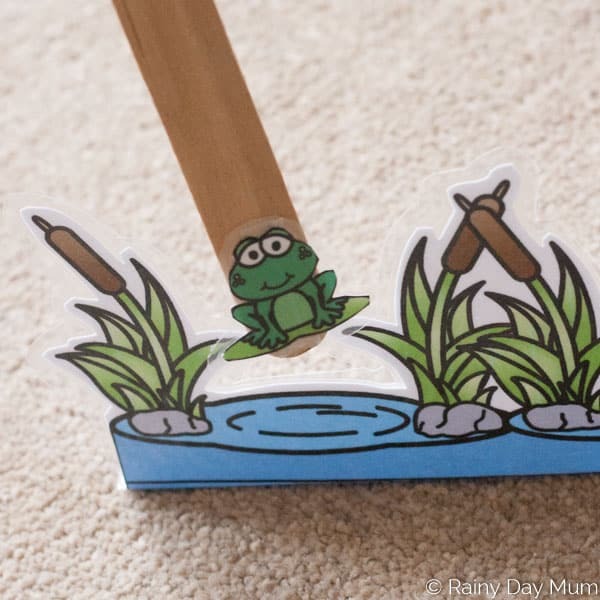 Find a fantastic selection of Frog Activities and Crafts for Toddlers and Preschoolers in our Hopping Mad Guide to Pond Themed Activities.